Prior to Safe Area Gorazde: The War In Eastern Bosnia 1992-1995 Joe Sacco's breakthrough novel of graphic journalism the acclaimed author was best known for Palestine, a two-volume graphic novel that won an American Book Award in 1996. Fantagraphics Books is pleased to present the first single-volume collection of this landmark of journalism and the art form of comics. 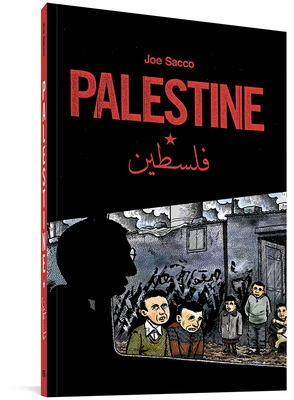 Based on several months of research and an extended visit to the West Bank and Gaza Strip in the early 1990s (where he conducted over 100 interviews with Palestinians and Jews), Palestine was the first major comics work of political and historical nonfiction by Sacco, whose name has since become synonymous with this graphic form of New Journalism. Like Safe Area Gorazde, Palestine has been favorably compared to Art Spiegelman's Pulitzer Prize-winning Maus for its ability to brilliantly navigate such socially and politically sensitive subject matter within the confines of the comic book medium. Sacco has often been called the first comic book journalist, and he is certainly the best. This edition of Palestine also features an introduction from renowned author, critic, and historian Edward Said (Peace and Its Discontents and The Question of Palestine), one of the world's most respected authorities on the Middle Eastern conflict.